I love soup. There’s something so comforting about the way it warms you up from the inside, especially on those chilly days. Soup is a regular part of my dinner rotation during the fall and winter. I think soup might also be the original one pot meal. 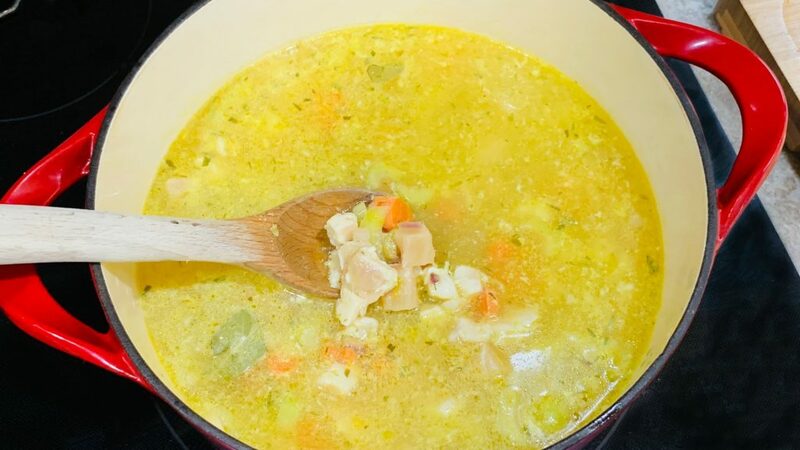 Chicken noodle soup is a classic, and one my kids often ask for. 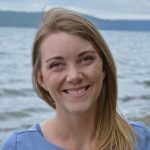 But how do you get all the comfort of chicken noodle soup without the noodles? Simply add in extra veggies and chicken, and you’ll have a totally satisfying meal. 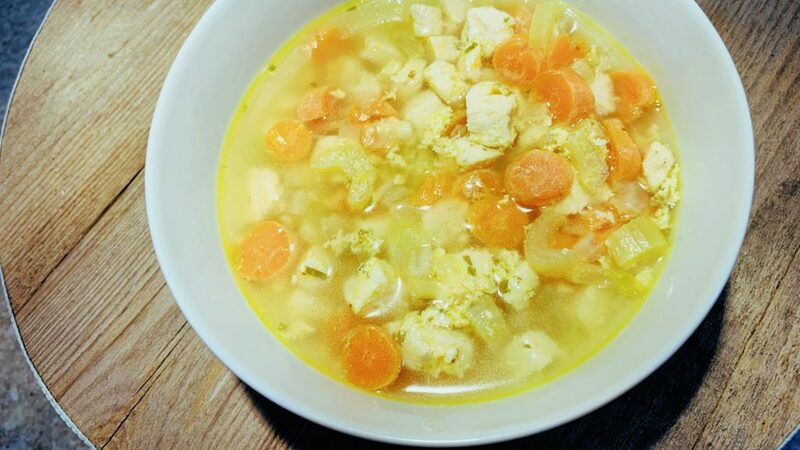 Noodleless Chicken Soup starts with diced carrots, celery and onion. Get them sautéing in the bottom of a dutch oven with 2 tablespoons of olive oil. I start adding in my herbs and spices at this point too, so that everything is seasoned from beginning to end (in this case tarragon, lemon pepper and bay leaves). I love putting lemon in chicken soup. Lemon pepper is perfect way to liven up the flavor. If you have a lemon on hand, try finishing the soup with fresh lemon juice and zest too. Once the onions start to turn translucent, add in the crushed garlic. Cook for another minute until the garlic is fragrant and add in the cubed chicken. Stir everything together and let the chicken start to brown. Once the chicken has started to brown, add chicken stock, water and bullion to the pot. Bring everything to a boil, and then reduce it to a simmer. I let my soup simmer on the stove for an hour. You don’t have to cook it this long; you can eat it as soon as the chicken is cooked through. Although the longer it simmers, the better it tastes. This recipe also works well in a slow cooker or instant pot/pressure cooker. It just depends on how your day is looking. Busy day ahead, then throw everything in the slow cooker in the morning. The instant pot is great if you forgot to start the slow cooker in the morning. 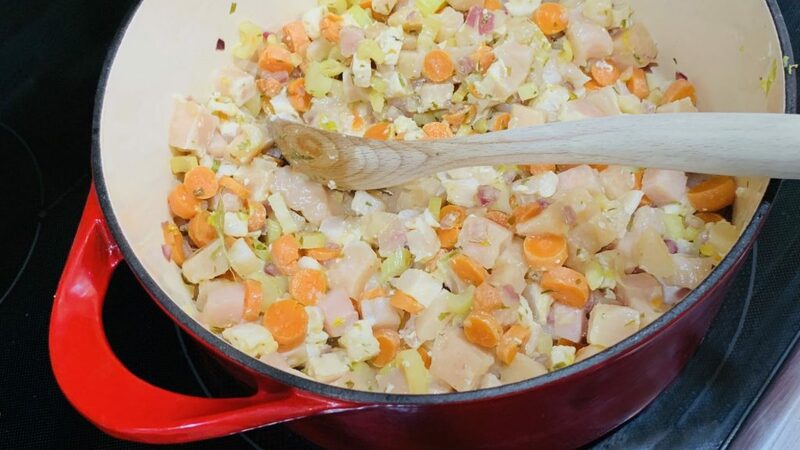 Or if it’s a relaxing day at home on the weekend, there’s something special about soup simmering on the stove while the family spends time together. The whole family loves this soup. I’ve made up a big batch before and taken it with us in thermoses. The perfect way to warm up when exploring outside on a chilly day. Sometimes I’ll make noodles separately for the kids. 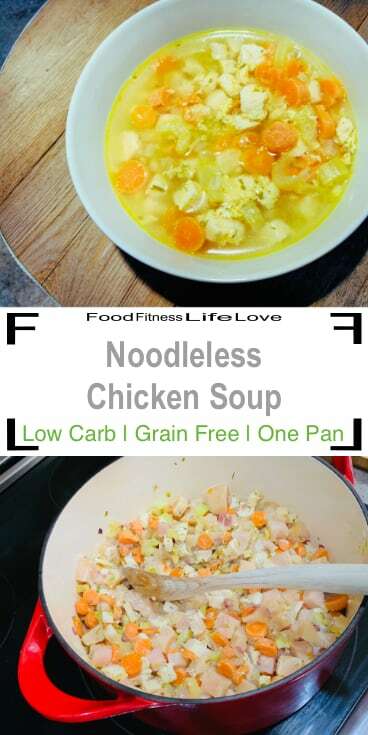 My husband and I always go for the Noodleless Chicken Soup, but the kids don’t always have to eat the way we do. I do believe they need some whole grain carbs for their growing bodies. Making the noodles separately is a great way to satisfy the whole family, plus then the noodles don’t soak up all the yummy broth. Heat olive oil in a dutch oven over medium heat. 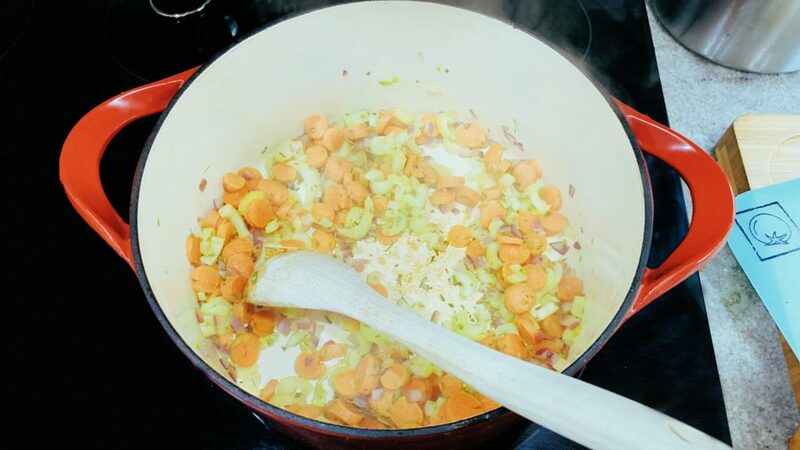 Add carrots, onion, celery, tarragon, lemon pepper and bay leaves to the pot. Sauté about 5 minutes until the onions turn translucent. Add the crushed garlic and sauté briefly until fragrant and add the cubed chicken. Brown the chicken for a couple minutes, then add the water, chicken stock, and bullion. Bring to soup to a boil over high heat. Once boiling, turn the heat down to low, put the lid on the dutch oven and simmer for an hour. Remove the bay leaves and discard. Optional: right before serving add the juice and zest of one lemon. Serve and enjoy.